A black horse is black all over - body, mane, tail and legs. Some black horses, however, do show patches of dark brown at certain times of year, certain stages of life or in bright sunlight. Black is the third most common color in horses and the least common of the base colors. Genetics: A black horse must have a dominant E gene. Thus it could either be: (EE) or (Ee) at the E gene. The A gene, however, must be homozygous for the recessive: thus, a black horse will always be: (aa). There are a couple different versions of the black gene, some causing a more brown/black and some a more jet black. Both these are represented by the recessive (aa) unless specified otherwise. 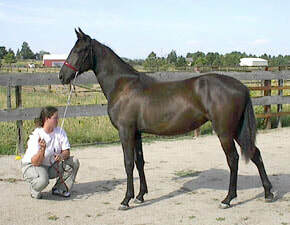 Description: Black horses has a black body color as well as black points - legs, mane and tail. It may be jet black in all situations or sometimes have patches which are tinted with dark brown. Black foals are often born looking dark brown, bay or even a slightly silver looking dark gray. They become progressively darker as they grown, sometiems continuing to look like bay horses until they are 3-5 years old. Paint - If a paint horse's base color is black, then the horse will be tobiano - black all over with large, irregular splotches of white. Roan - If a roan horse's base color is black, it will be what is known as a black roan, having all the normal coloring of a black horse with interspersed white hairs all over the body, legs, mane and tail. There are other colors which are sometimes be mistaken for black. Black Buckskin - A black buckskin horse is almost always mistaken for either a bay (brown) or black horse. In this case, the buckskin gene routinely fails to lighten the body color enough to distinguish the horse from a non-lightened horse. Often the only way someone finds out that their horse is black buckskin instead of bay or black, is when it unexpectedly produces a palomino or obviously buckskin foal. We called this horse brown for many years, not realizing she was a black buckskin until she unexpectedly produced a palomino foal. Dun - A particularly dark dun may be ocassionally mistaken for a black horse with some brown showing through. In this case, the dark dorsal stripe may be hidden by blending into the darker body color, and the primitive markings on face and legs may only be noticeable when the horse is in summer coat and in bright sunlight. Gray - All gray horses start out a different color. A gray horse with a black base color could easily be mistaken for a black until it gets older and its coat starts to turn.